What's the future of CPT Codes? 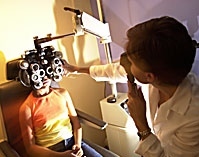 Doctors of Optometry (O.D.s/optometrists) are the independent primary health care professionals for the eye. Optometrists examine, diagnose, treat, and manage diseases, injuries, and disorders of the visual system, the eye, and associated structures as well as identify related systemic conditions affecting the eye. Doctors of Optometry prescribe medications, low vision rehabilitation, vision therapy, spectacle lenses, contact lenses, and perform certain surgical procedures. No matter what your age – from toddler up to grandparent – having an annual eye exam is a good thing! Did you know an eye exam can lead to early detection of diabetes, high blood pressure, heart disease or stroke? Has your child had a comprehensive exam? If not, you could be risking their learning ability and quality of life. Find out more at www.ThinkAboutYourEyes.com!